Have you heard about the Mamma Mia island? Or Kalokeri island? The Mamma Mia! movie shot in 2008 resulted in a real fuss about the filming location and that small white chapel on the rocks. And since then Skopelos (yes, the real name of the island is Skopelos) has been gladly welcoming tourists to see the places of their favorite scenes and find out that the island has much more to offer than the beach and the church they remember from the movie. 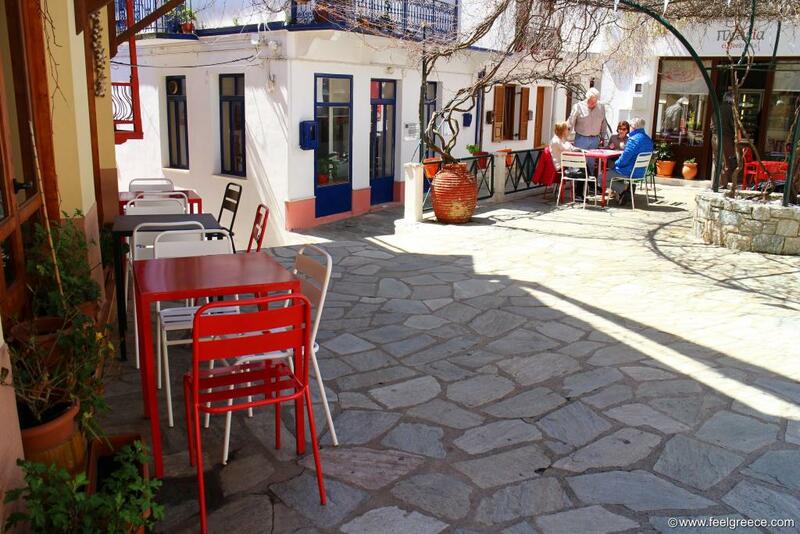 The promenade of Skopelos Town (or Chora) is a nice place with cafes and typical North-Aegean architecture. But when you make your way through the maze of small alleys in the Old Town, the spirit of the Cyclades and Dodecanese interferes, making a mixture of various island styles and creating a unique atmosphere - whitewashed facades, red roof tiles, blue or green window covers and wooden balconies Not to forget the abundance of flowers and the number of churches and chapels - their number reaches up to 360 only in Skopelos Town! Seems each house there has its own church and you will see most of them during your walk but Panagitsa of Pyrgos is a must - it is at the harbor and there is no chance to miss it. 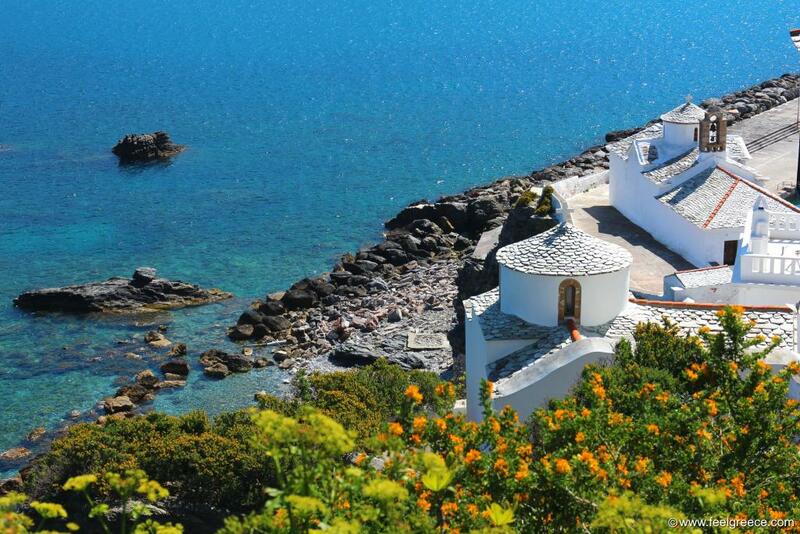 How can you go to Skopelos and not visit the famous chapel? 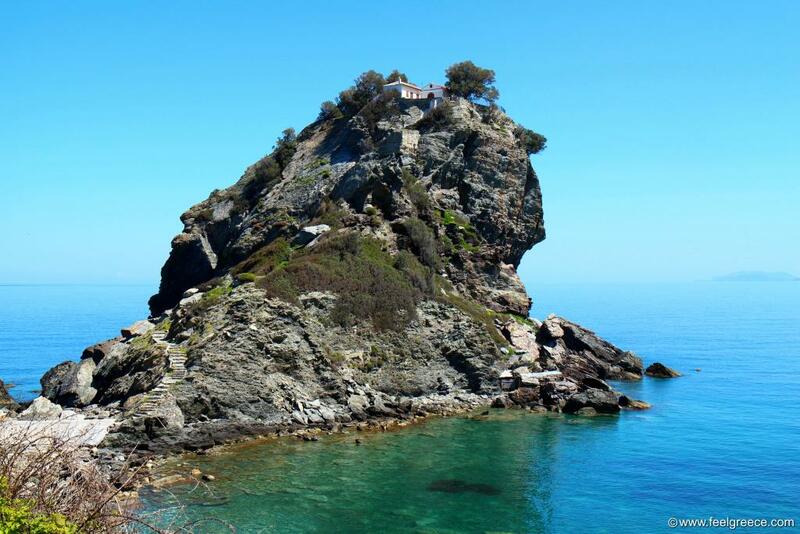 Agios Ioannis Kastri is on the top of a sea rock, located in a very green but not populated area of the island. So, you need a car to get there as the public bus will not do. And once you reach it, you have two choices: 1) You can make a selfie on the background and head to the nearby Agios Ioannis beach from which you can watch the chapel all day long, and 2) You can climb up the 110 steps to reach the chapel and be rewarded with a great panoramic view of the entire coastline around, including Agios Ioannis beach. The second largest village of Skopelos, Glossa, is built amphitheatrically on the slopes of a hill above Loutraki, the other port of the island. Like the capital Chora, it has narrow winding alleys and beautiful old houses with bonus view of the sunset and Skiathos island. 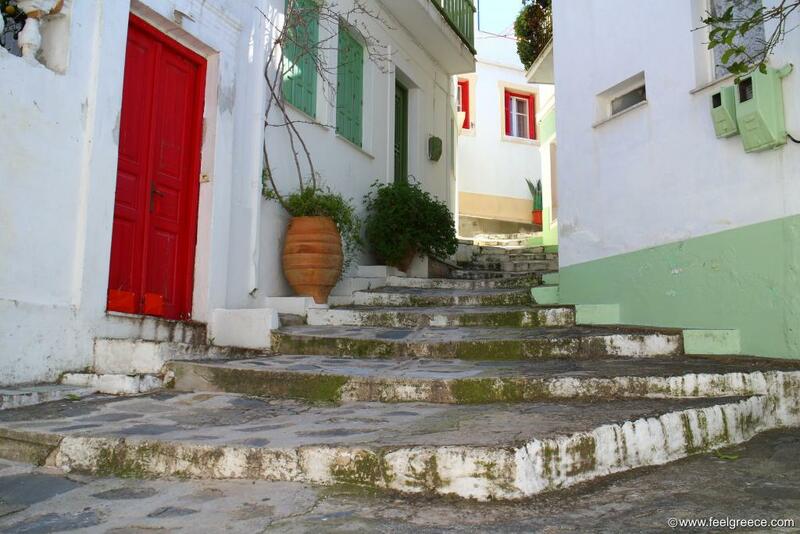 All alleys of the village gather up at a small square on the top and this is the place where you can eat along with locals in the family run taverna. 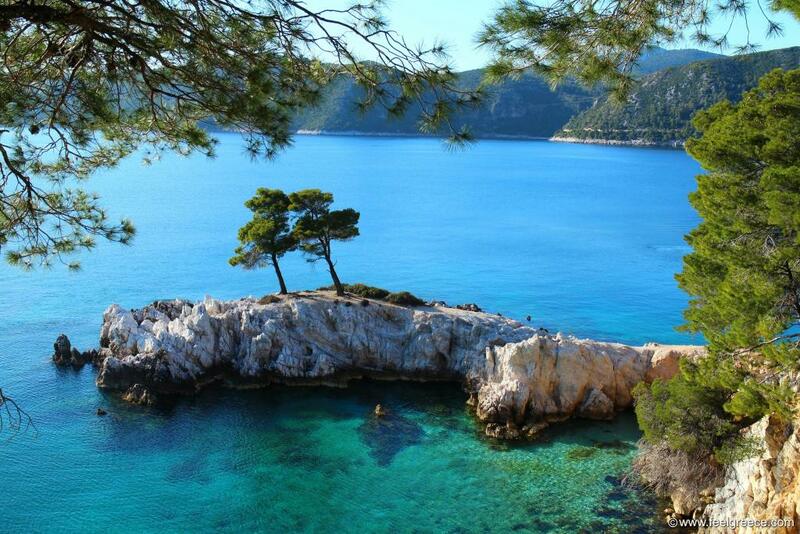 The two lonely inclined trees sticking out of a sea cliff are an emblematic place of Skopelos. The location is Amarandos, a rocky cape near the village of Agnontas. The water around this cape is extremely blue and transparent, perfect for a swim or snorkeling. A narrow canal next to Amarandos is called "piscina" by the locals which means "swimming pool" - no need to explain why. Mamma Mia beach - that is how they call Kastani now because some of the movie scenes were shot there. 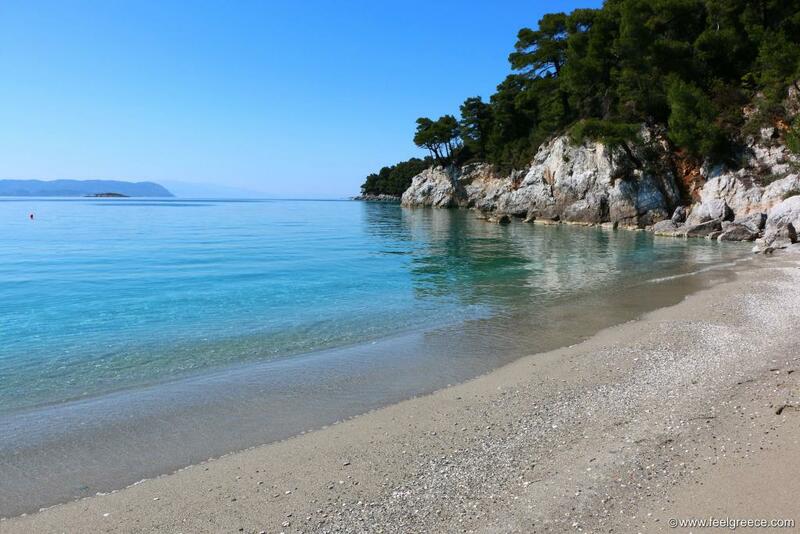 It is one of the most sandy and beautiful beaches on Skopelos, located next to Milia beach and easily accessible from the main road. You can combine it with a visit of the nearby picturesque bay of Panormos where the tavernas put their tables right on the shore. Or you can take advantage of the sunbeds and parasols offered by the beach bar on Kastani and swim in the clear blue water. 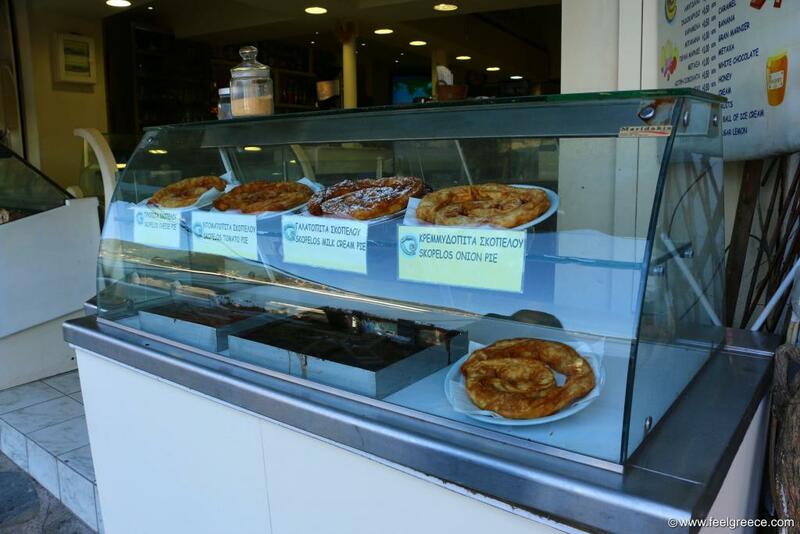 You can find it in the bakeries and some cafes in Skopelos Town and Glossa. Skopelos pie is the local delicacy made of filo dough and filling of cheese, onion, tomato or milk, curved as a snail. The taste resembles the traditional bougatsa and tiropita sold all over Greece but this one is very tender and the filling is a bit sappy. Delicious, in one word. There is some difference in the preparation but locals keep their secrets regarding it. Mount Palouki occupies a small peninsula next to Skopelos Town. The peninsula is not inhabited but it hosts a few monasteries and churches accessible via dirt roads. Don`t be scared of the roads, they are in good condition although not paved. 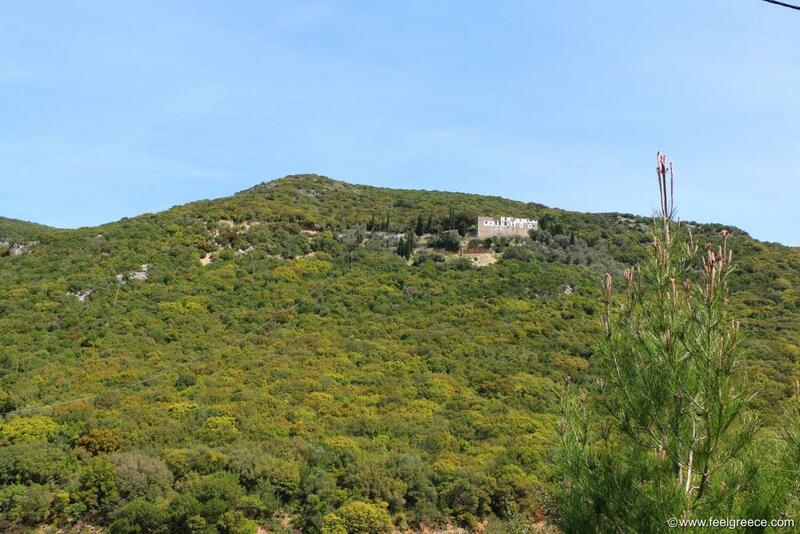 The mountain ridge is high and most of the monasteries offer panoramic views of Skopelos Town or the sea and the shore. The Monastery of Evangelistria overlooks the entire bay of Skopelos Town and it is the closest, reachable via a separate road. The rest are spread in the remotest part of the peninsula, as the one built to the highest point is the Monastery of Timios Prodromos.